Honeymoon Package by Silken Siete Coronas! Honeymoon Package by Silken Siete Coronas! From 118€! Would you like to surprise your partner with a romantic weekend in our hotel? We have just prepared for you this package that gives you a chance to spend an unforgettable weekend in the company of your partner. This package includes: Bed & Buffet Breakfast. Choice of daily set menu lunch or dinner at our restaurant. Late check-out guaranteed until 16:00. Weekend Package by Silken GHDB! Weekend Package by Silken GHDB! From 194€! Experience a different weekend at the Silken Gran Hotel Domine Bilbao! Treat yourself and make the most of the weekend with this package we propose you. This package includes the following services: Accommodation. Breakfast buffet on our terrace "Buenas Vistas". Hospitality Domine consisting of half a bottle of wine and assorted Iberian. Parking Inclusive Package!! From 101€! If you come by car, this is the best rate for you. In this rate the car park is included! The Silken Diagonal Barcelona stands out for its modern architecture and interior design by Barcelona architect Juli Capella, who created an inspiring game of contrasts in black and white for the façade. Sweet Dawn Silken Al Andalus Sevilla! Sweet Dawn Silken Al Andalus Sevilla! From 85€! Enjoy with your couple a romantic weekend. Dream with a special evening with a cold bottle of Cava and chocolate truffles at your arrival. In the morning you will enjoy the marvellous breakfast in your room, taking a freshly squeezed orange juice without getting out of the bed … and do not hurry because this package also includes a late check out until 15.00 hours. This Package includes: Accommodation in one of our confotable rooms. Bottle of Cava & Chocolate Truffles. Continental Breakfast in the room (until 11:00 hours). Late Check-out until 15:00 hours. Gastronomic Package by Silken Indautxu! Gastronomic Package by Silken Indautxu! From 140€! The Silken Indautxu Hotel proposes you an escapade to Bilbao to taste the world famous Basque gastronomy. This package includes the following services: Breakfast Buffet. Bistró Silken menu either lunch or diner (at your choice). Two drinks at the hotel bar. Early check-in. Late check-out. Spa Break Package!! From 180€! It’s time to relax! This package includes: Accommodation. Buffet Breakfast. 1 Spa circuit (per person). 1 body treatment (55 min per persona). Romantic Package by Silken Coliseum! Romantic Package by Silken Coliseum! From 121€! Fall in love in a movie hotel. Reserve our romantic package and enjoy this moment with that special person. Maximum occupancy per room: 2 people. This Package includes: Accommodation. Breakfast Buffet. A Bottle of Cava and Chocolates. Relax You in The Orange Blossom Oasis! Relax You in The Orange Blossom Oasis! From 100€! This package includes: A 30 minute massage, aromatherapy, sauna and Turkish bath. Accommodations in one of our superior room. Breakfast buffet. "Elite" Club access. Late check out until 16:00 hours at no extra charge. More Ideal for couples where they will enjoy an unimaginable break & hellip; with a 30 minutes massage, aromatherapy, sauna and Turkish bath. Accommodations in one of our superior room. Have a balcony where to enjoy the light and the sun which characterise the city of orange blossom. Furthermore, the executive room has trousser press, bathrobe and slippers, apart from that all the facilities that confort room has. Taste the magnificient buffet breakfast. Furthermore, you will have access to the most exclusive club, "Elite", which offers a private meeting room, secretarial service and the possibility to have at their disposal a resting area to enjoy a snack o a drink in the evening. In addition to this, you do not have to hurry up because you could check out until 16:00 hours without extra charge. Business Package by Silken Gran Teatro! Business Package by Silken Gran Teatro! From 85€! The Silken Gran Teatro Hotel has designed this offer specially for those guests travelling for a business purpose. The package includes: Double room for single use. Breakfast buffet. WIFI. Welcome gift. Fax service free of charge. Early check in. 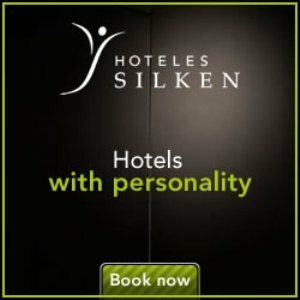 For Silken Hotels, a hotel is a place with its own personality, a place with lots of character and plenty of feelings. A bit like the home of those friends who are really good hosts, where you are always welcomed and pampered, where they know your tastes and make you feel right at home, with the wonderful advantage of having left monotony well and truly behind.